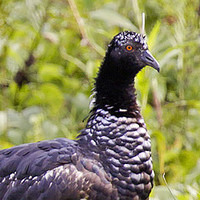 Notes: Looking like it’s come straight out of a children’s fantasy story, the bizarre Horned Screamer is found along rivers and freshwater marshes in northern and central South America. This species is very vocal and it’s rather unmusical honking duets are a common sounds in Amazonian open wetlands. Read more.